Do you want to adopt a baby but don't know where to start? Worried about the cost and the time it will take? Nandini too went through the same doubts, fear, and confusion before her daughter Kiki came into her life nearly three years ago and turned her life upside down. 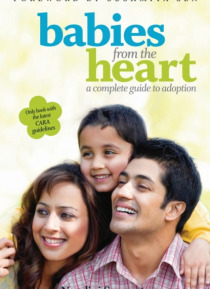 And out of her experiences was born Babies from the Heart, a comprehensive resource for couples who want to adopt a child in Indi… a. Written in her unique personal style, it takes you through: Each step in the adoption process, from choosing an agency to bringing a child home Getting the family on board Medical, emotional, and legal issues The process of telling the baby she's adopted Discipline issues with teenager adoptive kidsWarm, reliable, and honest and with practical advice and tips from a cross-section of adoptive parents, Babies from the Heart tells you all you need to know to adopt a child.